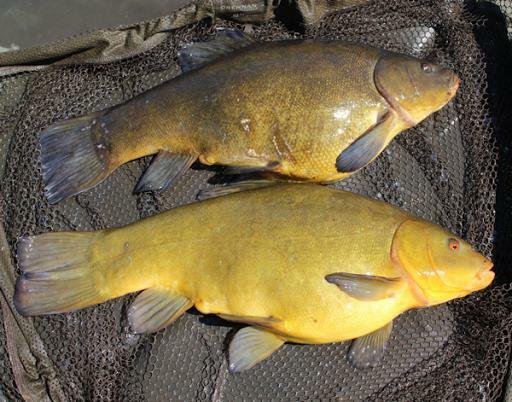 A double figure tench has been hot on my radar for a long time. So this spring I wanted to put 110% effort into my tench fishing. Half the battle is finding the venues which hold these mythical creatures but fortunately I’m a member of a syndicate which holds such specimens so its just down to me to try and achieve my dream. 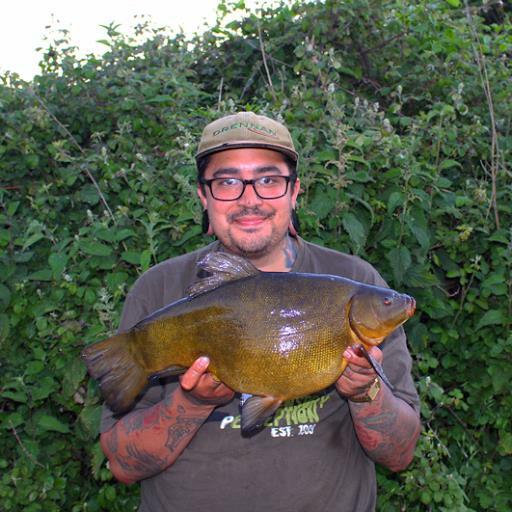 After catching the specimen crucian I was after I was hyped up to start my tench fishing. My first session was towards the end of April. Early for some tench Angler’s but I was keen as mustard. With limited time to fish I do all my preparation at home IE rig tying and bait prep at home so when I finally get to fish I can fish hard without having to waste time on the bank. I’m also lucky enough to finish work at 12.30pm so with all my rods set up, rigs tied and bait prepped I flew down to my syndicate. I arrived to an empty lake so I had the pick of swims, the weather had been mild and still was so I was hoping the tench would be active and they’d give them selves away. After I walked the lake I couldn’t see any signs of tench so I opted to drop in an area where I’d caught in previous sessions. Even though I had the swim mapped out I still like to lead about just in case I found a new favourable spot. To my surprise i didn’t find any new weed growth or any new spots so I stuck to my original spots from previous sessions. 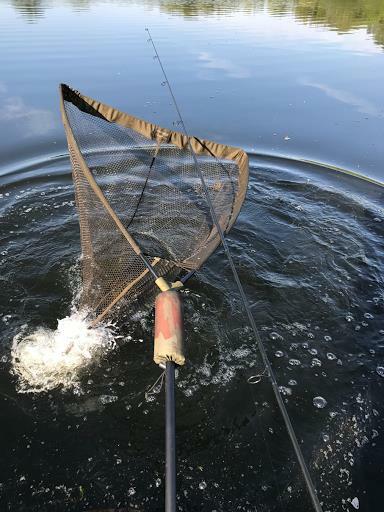 I applied several large Spombs of hemp and maggot to a spot about 30 yards out and I fished two maggot feeders with artificial casters as hook baits over the top. For my third rod I dropped it in close and fished method feeder with a small boilie knowing the tench regularly trip to the carp Angler’s. With the rods fishing and bait over each rod I sat back and dreamed of what lay ahead for this spring.. one of the rods which was fishing over the bed of maggot and hemp tore off.. lifting into the rod I could tell it was a tench because of the tell tail head shaking. This fish really made a good account of itself! She was soon in the back of my net! I thought to myself.. god how I missed catching tench! They really do pull back! She was a fin perfect tench with not a mark on her. She swung the needle over 8lb+ I was over the moon with my first tench of the season from my syndicate. I thought my luck would be in getting one so early On in the session but I didn’t get a single bleep for the rest of the quick session. I woke up at first light and sat there in anticipation of a bite but it just didn’t happen and I had to be home for 7am so I went home with just the one tench that trip. Happy to of opened my 2017 tench account I was keen to get back to the syndicate but with work and family commitments it didn’t happen for a while. But I had a social in the pipe line with my good mate mark. 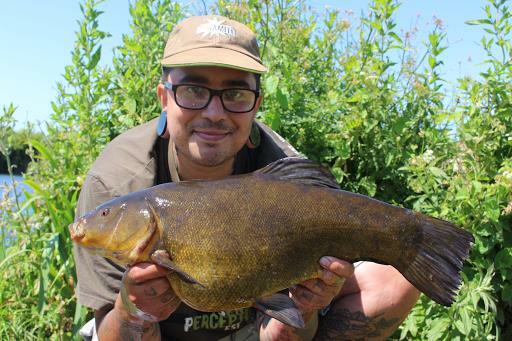 Fishing with a like-minded angler and the chance of a tench what more could you want? Time dragged and work days past and surely soon enough it was time to get back down the lake this time with my mate mark. I was buzzing! Although the weather had other ideas we’d had a mild march and start to April but no the weather gods had other ideas they wanted to chuck us some freezing cold north easterlys and temps as low as 0! Un phased by this we still decided to fish. I arrived on the Wednesday and mark was due to arrive at first light on Thursday. I situated myself in a swim I’d been trickling in bait. Usually I don’t like to put all my eggs into one basket but with the low temps and Baltic winds I figured fishing over my baited areas would be a good start unless the tench gave me some other signs to move on to. I fished my usual set up. One rod on a open end cage feeder fished heli style with a short supple boilie rig with a complex t boilie attached to it. I fished this on a nice margin spot. About 8ft deep and the spot was solid where the fish had been feeding on it. With a solid drop I was happy! For the other two rods I fished them about 20 yards out again on a spot is been baiting and fished the same heli set ups but one with corn and the other with artificial casters. I then balled out some ground bait which was mixed with crushed and whole complex t 12mm boilies, corn, hemp and pellet. 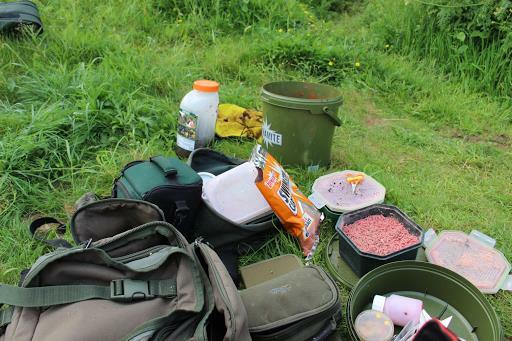 After baiting up both areas I began to set up my brolly etc. Whilst doing this I’d already started to receive good liners off of the margin spot, the fish had obviously moved with the wind and had been preoccupied on my baiting? I knew it wouldn’t be long for the rod to tear off and I was right it didn’t take long and I was into the first tench of the trip.. for all of a minute before the hook pulled.. gutted! You don’t want to be losing tench from this water! I soon had the rod back out and was licking my wounds when the again the liners began and re-ignited my hope which was lost! And again the rod tore off sadly a carp was the culprit ! I re-baited the area this time and then re cast the rod and to my surprise again the liners started! They must of been grouped up down there due to the winds etc! 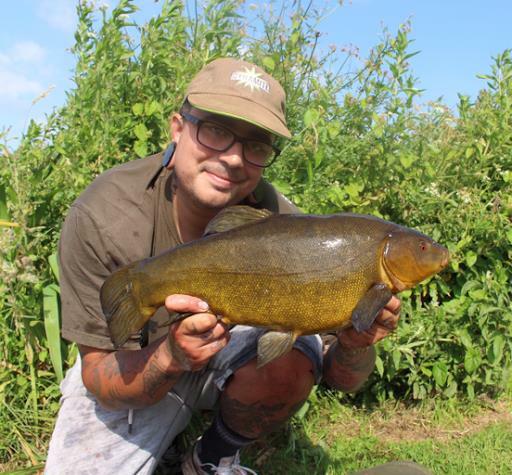 I sat watching and waiting for a bite to materialise and soon enough it did and again I was into a tench a big tench! She showed early on in the fight and gave a good account of herself before the hook pulled AGAIN! I took some action this time and changed my rig. I shortened the hook link and shortened the hair and upped my hook size. More confident with the boilie rig I re cast it back out onto the area.. sadly the liners had diminished as did my confidence. The sun had dropped as did the temps by this point and as per usual I under packed and left my warm clothes. I retired to my sleeping bag early.. which I’d also forgot to layer up with! That night was brutally cold and I barely slept! I still woke at first light and looked for signs of tench but I saw nothing.. other than the odd carp which rudely took one of my hook baits intended for the tench! Mark soon arrived and we began our social. I put mark onto a area I knew had form and in true style he landed three cracking tench to 7lb and sadly lost one of the bigger girls! I luckily had a bite from a 8lb female at midnight! No other bites fell to our rods but we had a cracking social! Again my time was limited so I fished the odd work night. Fishing work nights meant I got to the lake late and had to be off by 6am to get to work to work. I’m not going to lie I struggled. 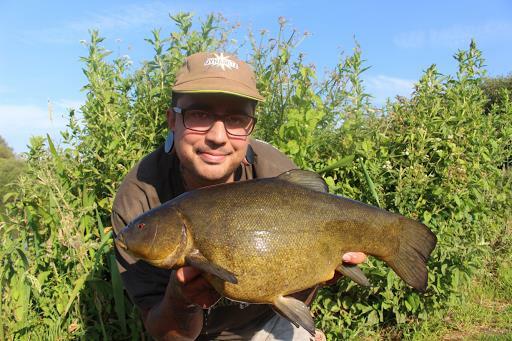 I only landed a small 5lb male and every time I left the tench were bubbling up on my spots going mad! It was hard to stomach and for the first time in a long time I started to lose the buzz. I fished another social with another mate. Sadly no tench fell to our rods that 24 hours only bloody carp! By this time we were in May! And I knew my chances of a double were running out! I was due to get married 1st of June so I had to prep a lot for that and of course I also had my work and family commitments. Time flew by and the lack of fishing was sickening.. but I ended up dropping on a new venue with a mate again for a social. New to the water I didn’t know to much other than what my mate had told me. It was a very weedy water covered in blanket weed. The lake was busy so we dropped in where we could. I had a lead about but struggled to find any clear spots and the swim was tight so it restricted me from casting about. By this time it was 7pm so I just clipped up both rods to the same distance and fished on top of the blanket weed with maggot feeders fished heli style with short hook links moved up the leadcore about 12″. I fished chopped worm on one and maggots on the other. I fished both rods close together and Spombed out some red krill ground bait mixed with hemp, maggot and chopped worm onto the area. New to the water I didn’t know what to expect. I was shattered from a day’s work so I just sat back and took it all in. I could see tench rolling around the lake and different patches of bubbles pluming up here and there. 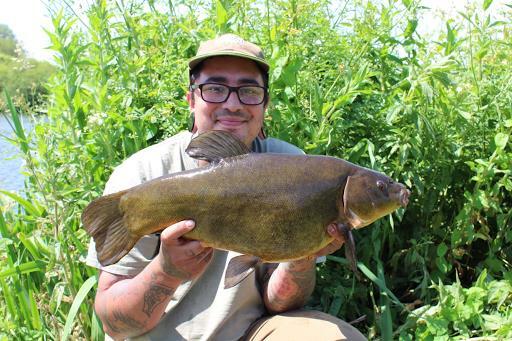 I was confident in my approach and just hoped a tench would slip up. I began to receive liners on both rods which was promising. Usually I’d re cast regularly with maggot feeders but as I was getting liners I opted to leave the rods out knowing feeding fish could be present. Out of nowhere my left rod absolutely screamed off! And I lifted into my first fish from the venue.. sadly the fish had other ideas and weeded me up solid and sadly the hook pulled! Gutted by loss but also confident of another Bite I recast the rod back out onto the spot and brought in the other rod also changing this to a worm hook bait and re cast that rod back out onto the baited area. The liners picked up again as did my heart rate.. and again the left rod was away! This time I put more pressure onto the fish not letting it gain to much line. After a good scrap I slipped the net under my first tench from the venue! 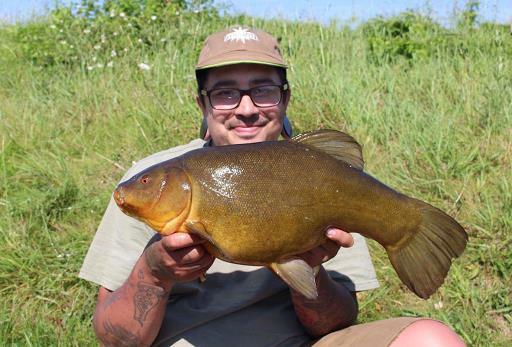 My mate came over and helped me weigh and photograph the tench and I returned her back to her home. I was buzzing! 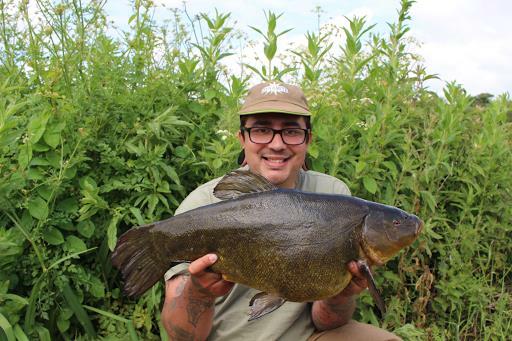 A lovely dark 6lb+ tench from a new venue. With the light slowly fading by this point we were due to leave soon but another tench made a appearance before we left and it was a real plump female which spun the dial to 7.11lb. Buzzing with the results from a short evening session we set off home. I was shattered from work and I had be up early for my stag do, a weekend away on a carp lake with seven of my mates perfect! Although I was excited the thought of tench were still embedded in my mind. My stag do went really well and we had the best laugh and had a cracking social with the odd drink and under cooked BBQ’d food with some bonus carp landed by all expect one lad it was a top weekend! I even managed to up my carp personal best to 33.8lb! Can’t grumble at that! With my stag over and my wedding day inanimate I fancied another crack for the tench! A day before my wedding? Why not! 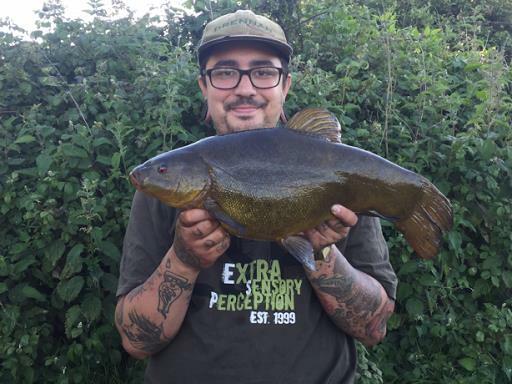 A good pal was up for the trip so talk started about going to the venue and soon enough we were both driving down the motorway at 3.30am in search of tench! We arrived at the lake to find it fairly busy. My mate dropped in a swim and I decided to wait for an area which was becoming vacant within the hour. The gentlemen who had left had a few tench but the other two lads in the swim to the right had struggled. I remained optimistic and hopped in the swim after the gentlemen had left. I quickly set up my lead rod and had a feel about and settled with an area again fishing on top of the blanket weed. Usually I’d find a clear spot but the weed was really rich with food and did ok the previous week so I was happy to fish on top of the weed again. I applied the same methods as last time but had a third rod with me this time so I fished three rods spread out on one area. Usually I don’t like to put all my eggs into one basket but I thought I’d see what happens. If it was slow I’d re lead about and find a new spot and fish the third Rod on a different area. Also where I had the whole day ahead of me I decided to put out a fair bit of bait over a big area over the three rods which were fanned out over the spot. After all the chaos of setting up and getting the bait out I finally sat down and started to watch the water. Already I had seen tench rolling in the area and saw some bubblers to! The liners began and my spot slicked up! A good sign! The liners became more savage and before I had time to think about recasting the rods back out the middle rod tore off and I was into my first tench of the trip! The bloke to right of me was surprised due to the lack of inactivity they’d experienced as I was I. I slowly guided the tench to the net and my mate came over and did the honours with me. It wasn’t even 7am and I’d received my first bite! I was confident and hopeful that the day would pan out to be a productive one! 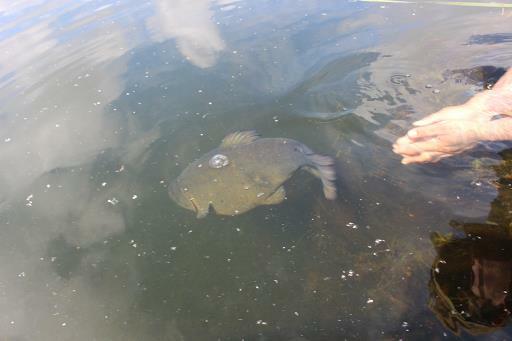 I wasn’t wrong.. my mate came walking over to my swim with a clonking great tench in his net! It was a fine specimen and I took some lovely shots for him to return the favour for his morning handy work. It started to slow up a little so I topped the swim up with a few more spombs and re cast all three rods back out onto the area. By this time the sun had burnt through the mist and it was beginning to be a hot day and me being me picked the swim with no shade at all! Whilst having a day dream my middle rod again tore off.. this time I was into what felt like a bloody big tench, for a short while I thought it could of been a carp whilst flat rodding me peeling line from the spool! Luckily I gained line as quick as I had lost it and I was soon directing the big fish towards me! 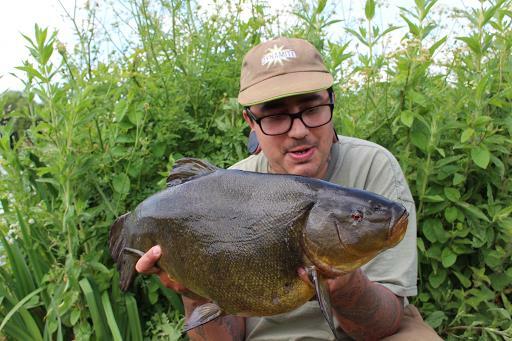 The fish rolled on the surface.. A BIG TENCH! My heart at this point was racing and I played this big tinca as if my life depended on it! Slowly but surely she gave up the ghost and I guided her into the net! I was astonished when I saw the size of her! I immediately shouted at the top of my lungs for my mates assistance. As I gazed at the fish I could see his feeders skipping in through the corner of my eye and I waited in owe for my friend. We both laughed in amazement and soaked it all up! She spun the needle round to 10.3lb. We reset the scales and weighed her again just to make sure everything was accurate and sure enough it was. I was over the moon! A double figure tench is a fish I’d dreamed about catching for many years and to of achieved it in two seasons I was over the moon. Although I have to admit I was a little wounded that I hadn’t caught my first double from my syndicate but that’s the way things go and every thing happens for a reason. Overwhelmed by it all we had some lunch and chilled out a bit before getting back to the fishing. By this time it was lunch time and I’d really caught that sun. I topped the swim up with a healthy amount of bait and changed my worm hook baits and filled the feeders and re cast all three rods back onto the area. 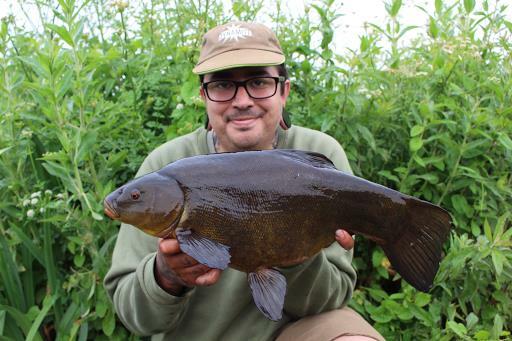 …and I also lost two more tench. We had to call it a day due to running out of bait! It was a hectic session! The more bait I put out the more responsive the tench became! 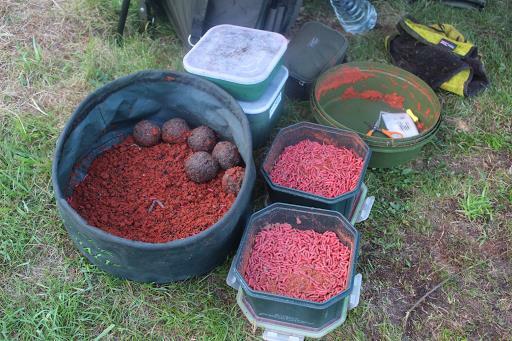 I ended up using three bags of ground bait, three big jars of hemp, six pints of maggot and half a kilo of worms and a few tubs of lob worms! What a trip! And To of caught my target the day before my wedding was the best early wedding present ever! I had a small break from fishing after getting married but of course tench angling still stayed firmly fixated in the back of my mind. After having some lovely time off with my family it was back to reality which meant back to work etc. 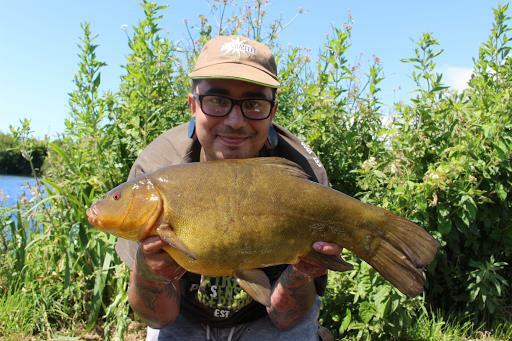 It was the start of June now so my tench fishing was nearly over but I wanted to make sure I squeezed in a couple of sessions before I move onto targeting the next species of my desire. I always try and book off the traditional 16th of June. And this year wasn’t going to be any different so with two days off of work looming I planned my next tench trip. I was due to guest a auction winner over my syndicate but with new members starting and the lake rumoured to be busy we moved our session to next spring, this opened up new plans so I decided to drop back on the venue I had the double from. Work dragged like usual but I was soon driving down the motorway with a big grin on my face gagging to arrive at the venue. 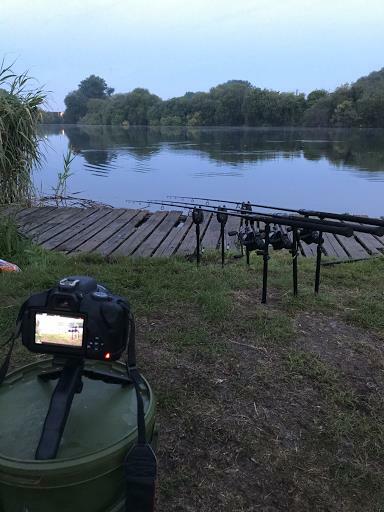 I eventually arrived at 8pm I wanted to get everything set up and get a lot of bait out onto the spots for first light so I didn’t have to rush about at bite time. This time round I didn’t want to make the same mistake as last time so I knew I had to take plenty of bait whereas before I ran out on my last session.. I dropped in the same swim as I had the double from. There were plenty of tench rolling all over the place so I was confident. I had a lead around and found some clear areas but again I opted to fish the previous area I’d fished last session on-top of the blanket weed as it’s rich with natural food! 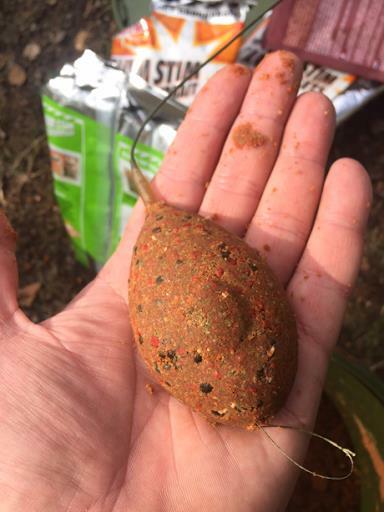 I applied a few Spombs of my chosen mix which consisted of dynamite red krill ground bait, chopped and whole worm, red maggot and half a jar of dynamite hemp. I opted to fish just until dark so I didn’t want to overdo it this eve I was just fishing for a bite. 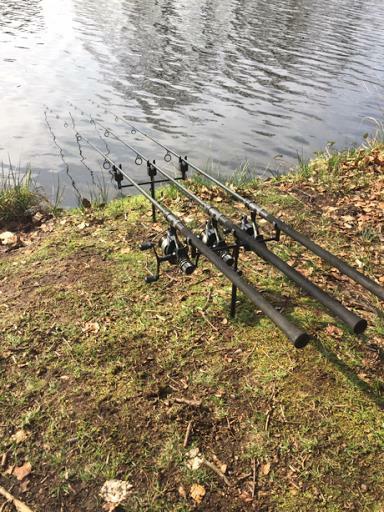 I fished all three rods on the same methods as before, feeders fished helicopter style with the use of leadcore leaders with the rigs 12″ up the leader to aid fishing in the weed. I used three short Fluro hook links on each all with chopped worm on the hair. Good reliable tackle. 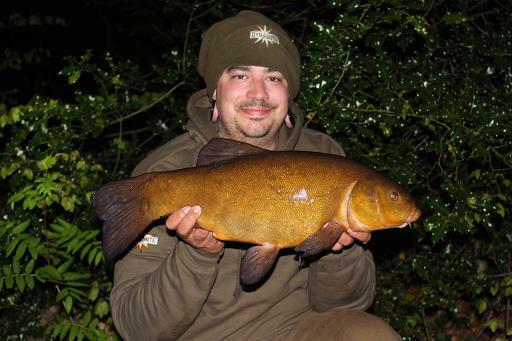 I had a small tench that evening before reeling in for the night. It was a restless evening as it was very hot and the mosquitoes were on form! I swear some of them were carrying baseball bats to!! Persistent little buggers! I had set my alarm for 3.30am but no need as I didn’t sleep.. the dawn chorus began and I also began my own dawn chorus.. my Spomb slapping the lakes surface and skipping in.. I put out about ten Spombs to start the day with. I then cast two rods a rod length apart on the same spot and I fished my third rod a little closer in to my right. With the rods and bait out I than began to feel tired so I laid back and watched the sun rise and began to watch the tench roll. The liners soon started and fish started to roll over my longer range spot. The liners didn’t develop into anything so I still stuck with my usual plan of re casting my feeders every half n hour. I know some Angler’s like to re cast more regularly but I choose not to and do what usually works for me. Especially when I’m bringing in fresh worm hook baits. The morning slowly drifted by without any action other than the odd liner. I knew a bite was just round the corner it was just a matter of when. I was stood looking out onto the lake when I heard the spool on of my reels go into meltdown.. I’d forgot to turn my alarm back on after re casting.. 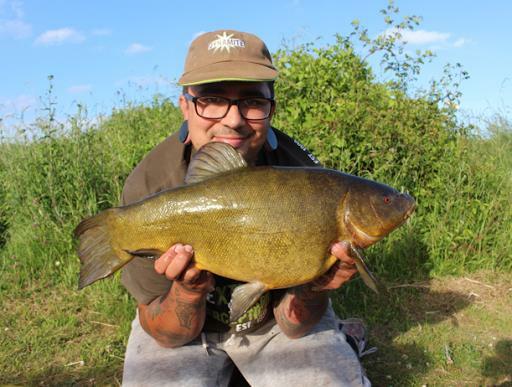 I picked up the rod and lent into the tench and from the off it felt like a good fish! It really made a good account of itself! And wasn’t best pleased when I eventually netted her! She was an absolute cracker and spun the dial to well over 8lb+ I was over the moon! I was happy with that! With no one about I used my self-take kit which I’d got the Hang of now so I was confident the shots would come out ok and surely enough they did. I attached a fresh lob worm and re cast the rod and decided to re cast the other rod back out onto the spot to. I also applied five more Spombs to the area. Something I like to do after I’ve had a bite. Again it didn’t take long and my first rod was away, again from the longer spot in the weed. 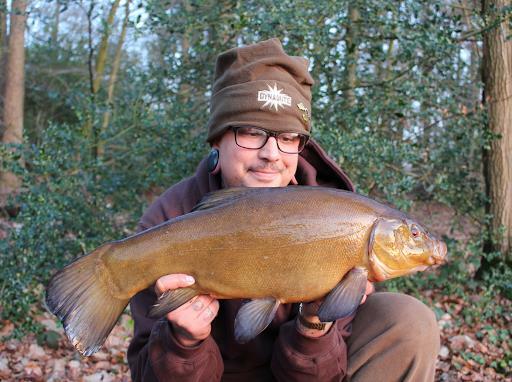 Another lovely tench which had taken a liking to my lobs! This tench was a lot smaller but still I’m happy to catch any sized tench. 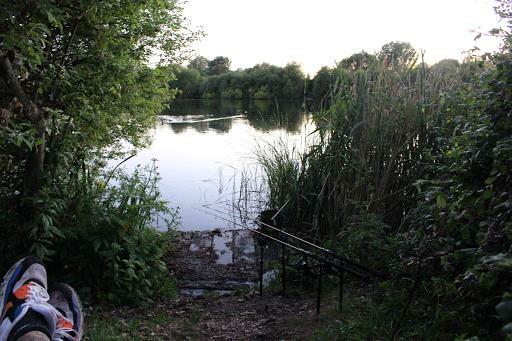 I recast both the long rods back onto the baited area and again topped up the baited area with a few Spombs. By now it was about 10am and the temps really had start to rise. My margin rod really hadn’t done anything all morning but I opted to keep recasting this rod keeping the area topped up. The fishing slowed right down and I didn’t receive any liners and there were no other signs of activity around lake. I kept the faith knowing that the tench could switch on at any given moment. And sure enough they did! My middle rod melted off and again I was into a hard fighting tench. And slowly but surely I guided the tench into the net! I didn’t even have time to look at my prize as my first rod also tore off! 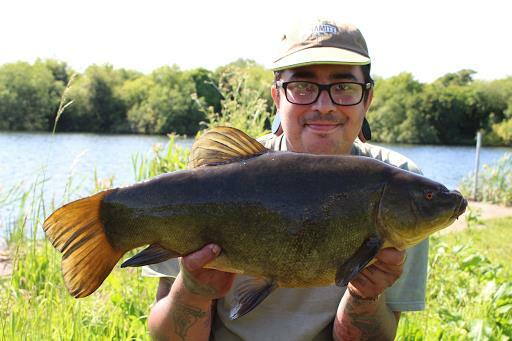 Again a hard fighting tench was the culprit and eventually found itself in the back of my net with the other tench! A lovely brace to! Both fish spun the needle to 7lb+ making me once again a very happy angler! And once again plenty of practice on myself take kit helped me get some cracking photos of the lovely brace before slipping them both back. Again fresh lob worm segments were threaded onto the rigs and both rods were deployed to the baited area. This time I decided to fan them out a bit and add my third rod to the baited area. Especially as the shorter rod remained motionless all day. I topped the area up with a little more than usual being I had three rods on the spot now. By this time the wind had picked up and cooled the air a bit raising my confidence even more! But again the tench had shut off again. But I waited patiently for their next feed up and re cast every half like normal. I had the chance to fish until dark but I was happy with my session so decided to pack down at 7pm to get home at a reasonable time. During the pack down I landed another two tench making the decision to leave even harder! Especially as one of the tench weighed bang on 8lb! But I’m not greedy? Maybe a downfall to my angling as many sessions before this I’ve been happy enough to leave when the action is good and I’ve got the opportunity to stay longer? Something a lad with limited time should think about? Food for thought! Maybe next time? But more than happy enough with the day’s results I slowly packed down and headed home. The temps soared over the next week pushing the tench to spawn again. With the rivers now open and other species calling that potentially could have been my final session of the year for tench? Who knows.. but I’m super happy with the beauty’s I’ve been lucky enough to catch this spring and start of summer.